Johnny Wheatcroft was stunned 11 times, allegedly including on his testicles. The family of a man who was shot 11 times with a stun gun, allegedly including on his testicles, is suing the city of Glendale, Arizona, and the three officers they say were involved in the incident. Johnny Wheatcroft had been sitting in the passenger seat of a parked car with his family and one friend in a Motel 6 parking lot when police officers approached the vehicle on July 26, 2017, according to the civil complaint. They had planned to reserve a room for family time, the complaint said. Police, however, said in a statement from the city of Glendale that they had observed the vehicle Wheatcroft was in commit a traffic violation and that after speaking with the driver, Shawn Blackburn, they discovered that Blackburn did not have a license on him. In police bodycam footage released by the City of Glendale, tensions escalated as the officers allege that Wheatcroft appears to shove something between the seat and the center console. 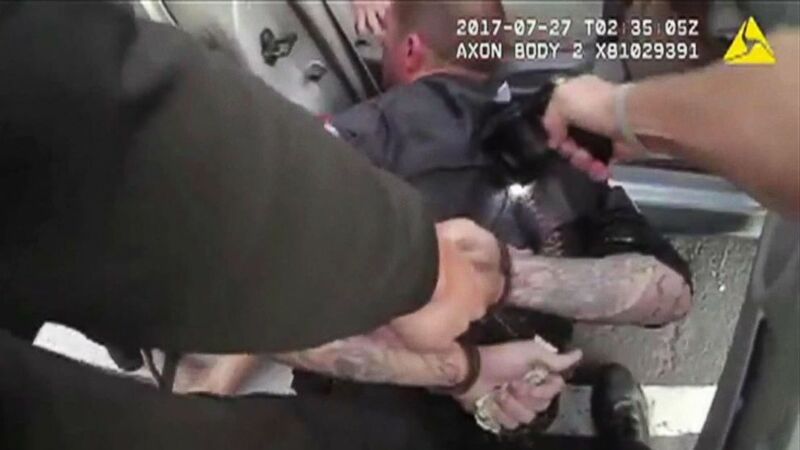 (Glendale Police/APTN) Glendale, Arizona police use a stun gun on Johnny Wheatcroft in an image made from police body cam video shot during a traffic stop on July 27, 2017. "I don’t want you stuffing anything down in between the seat like you’re doing," says Officer Matt Schneider, who unholsters his stun gun and points it at Wheatcroft's neck. The statement said that Officer Schneider and his partner Mark Lindsey attempted to remove Wheatcroft from the vehicle "for the safety of themselves and those around them" and so that they could "maintain a safe eye on him for the duration of the traffic stop." However, within seconds, the entire scene unfolds into chaos: Wheatcroft, while tangled in his seat belt, is stunned repeatedly. His wife, Anya Chapman, allegedly hits another police officer in the head with a bag full of bottled drinks, according to the city statement. Wheatcroft's children can be heard in the video screaming and crying from the back seat, asking their father if he is okay. Officer Schneider continues trying to extract Wheatcroft from the front seat but he remains tangled in his seatbelt. Finally, Wheatcroft's son crawls into the front seat and releases his father, who is dragged away from the car. Schneider, meanwhile, tells the son to get out and stand in front of the car. The boy, visibly afraid, ignores the officer and starts crying hysterically in the front passenger seat instead, the video shows. As more officers arrive onto the scene, one arrests Chapman while another tends to their son, removing him from the car, the video shows. "Please don't take my mommy," the boy could be heard screaming in the video. "Wheatcroft… was handcuffed on the ground… Schneider [then] pulled down [Wheatcroft's] shorts and tased his testicles and perineum," according to the complaint. "Keep fighting and you're going to get it again," Schneider can be heard saying in the bodycam footage. The footage continues to show Wheatcroft being lifted off the ground. As officers do this, Wheatcroft says that he can't breathe and that he has chest pains, to which Schneider can be heard saying, "Well, you shouldn't have been stupid then." Wheatcroft is then seen on the bodycam footage being led off to a police car and placed in the back seat. Following the incident, Wheatcroft was charged with aggravated assault. He "was then wrongfully detained in the Maricopa County jail for approximately two months," according to a statement from Wheatcroft’s lawyers. 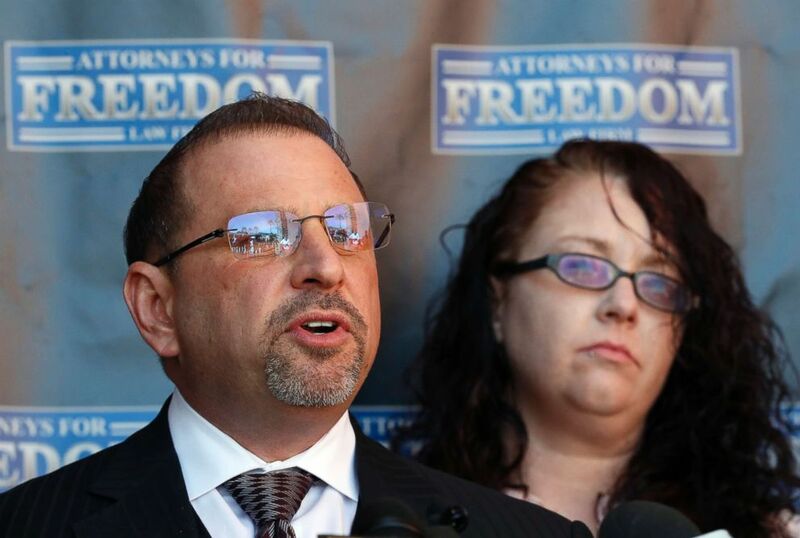 (Matt York/AP) Attorney Marc J. Victor speaks to the media concerning his client, Johnny Wheatcroft, Monday, Feb. 11, 2019, in Chandler, Ariz. as Wheatcroft's wife, Anya Chapman, listens. Wheatcroft's case was ultimately dismissed after the Maricopa County Attorney’s Office declined to press charges. "Through the process of reviewing evidence in the case involving Mr. Wheatcroft prosecutors reviewed the video and determined there was no likelihood of conviction due to the totality of the events leading to the arrest," according to a Maricopa County Attorney’s Office statement given to ABC News. "At the same time, prosecutors looked at the video and, due to the totality of the events, determined at that time the actions of the officer also did not meet the charging standard of — reasonable likelihood of conviction," continued the statement. The Glendale Police Department also conducted a review of the officers' actions and "discipline [was] implemented regarding certain tactics used by one officer," according to a statement by the City of Glendale. Wheatcroft is currently serving a five-year sentence for an unrelated burglary in the third degree. He had previously been incarcerated multiple times for drug paraphernalia, theft and burglary.